MTSU plans Veteran and Family ..
MT Engage 2019 reception celeb..
One of MTSU’s fun family events, the annual Easter Egg Hunt, is set this Sunday, April 14, on the lawn of the President’s Home at the corner of East Main and Middle Tennessee Boulevard. Children ages 12 and under are invited to join the fun from 2 to 4 p.m. Sunday at 2212 Middle Tennessee Blvd., where they can search the grounds of one of MTSU’s oldest buildings for colorful candy-filled eggs. The event is again free and open to the public. 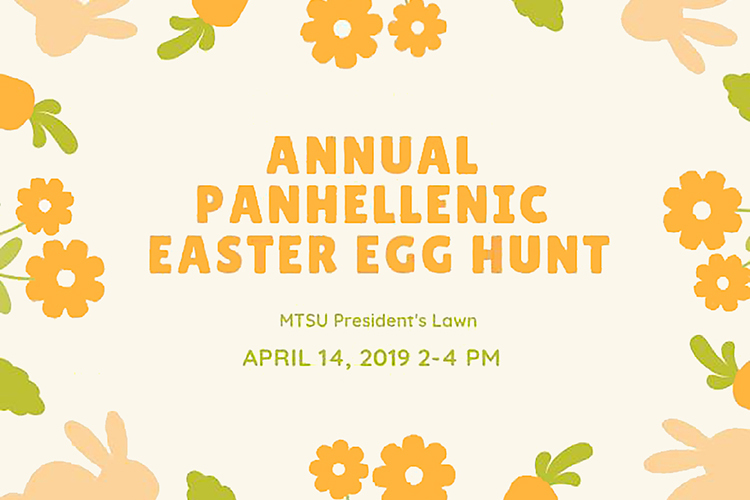 MTSU’s annual Easter Egg Hunt, sponsored by the university’s Panhellenic Council, is set this Sunday, April 14, from 2 to 4 p.m. on the lawn of the President’s Home at the corner of East Main and Middle Tennessee Boulevard. All guests should park at the MTSU Parking Services Building, located next door to the President’s Home, at 1403 E. Main St.
MTSU’s Panhellenic Council, which sponsors the event with support from the university’s sorority chapters, also will offer games for the youngsters to play. For more information, contact the MTSU Panhellenic Council at fsl@mtsu.edu or at 615-898-5812.